Meetings are a regular part of any job life. It is more so for the people who are in the management team. Meeting schedules, agendas and minutes are most important parts of holding the actual meeting. 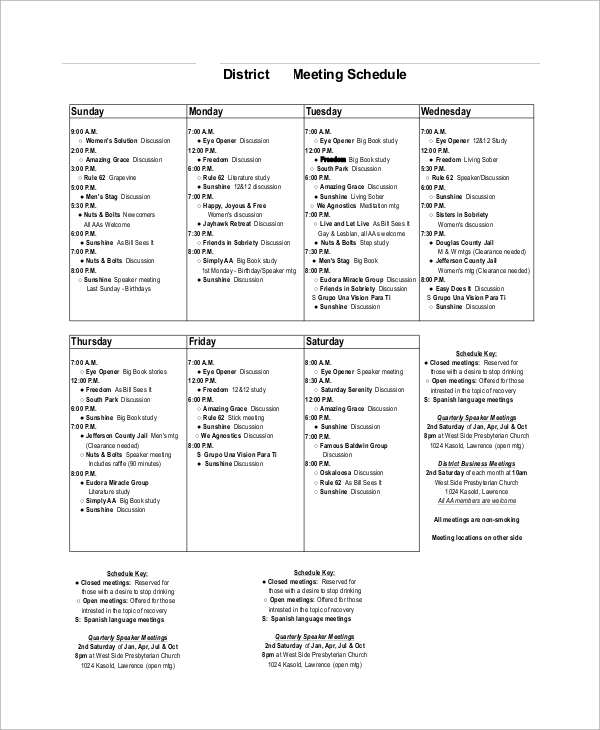 The following meeting Schedule Samples are professional in design, and they cover all the aspects starting from a schedule in different formats, agenda listing, and minutes. It makes it easy for the speakers and the attendants to understand the process and prepare themselves accordingly. 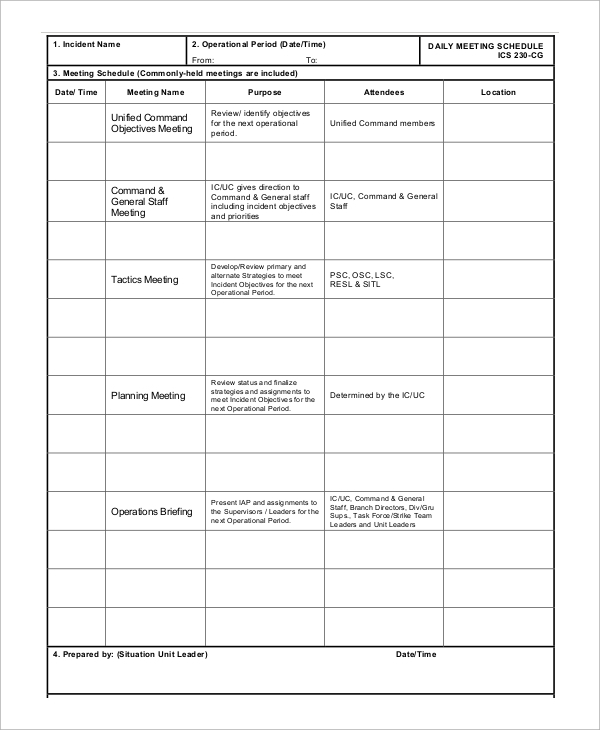 Board meeting schedule sample comes with a perfect meeting minute template and Meeting Agenda format. 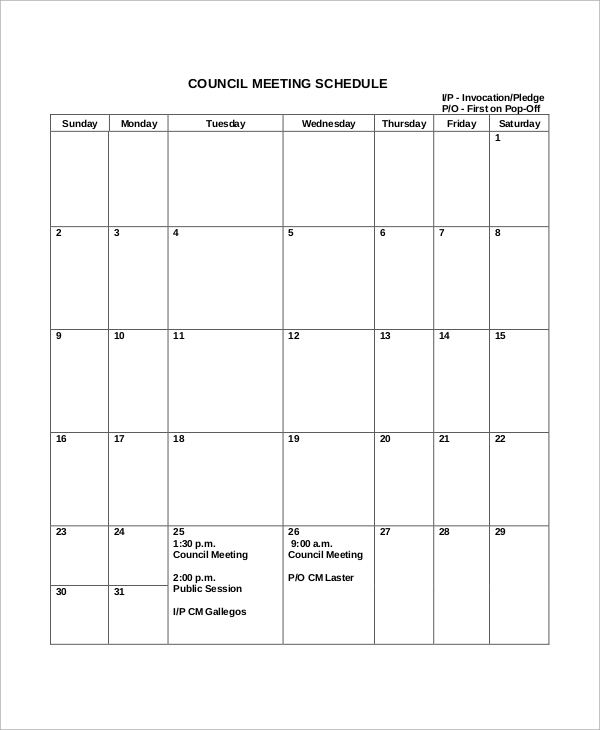 It lists the agendas and the members who should take part in the meeting every day and the members are briefed the minutes for preparation. It is an important part of corporate governance and evaluations. 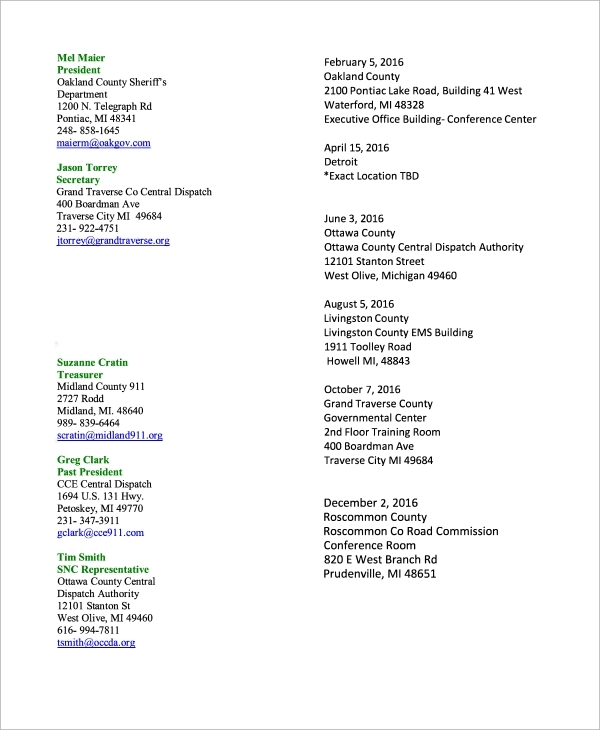 This is a meeting minute template for a council meeting. It is in tabular form, and it has a monthly timeframe. The details of the meeting can be written on an everyday basis. 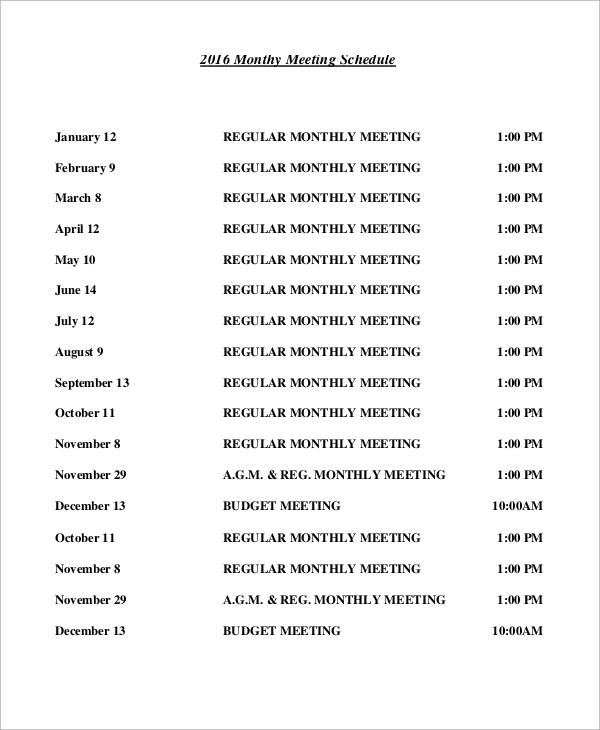 It has a Sample Meeting Agenda format where the agendas can be listed and send to the members to make them aware. This is a district meeting schedule which can list important speeches from notable persons and discussion of common problems. It can also be about different events taking place in the district for common people to know about them such as health camps, yoga camps and likewise. You can also see the the Class Schedule Samples. Meeting schedule is important to conduct a meeting professionally. Unless there is a proper meeting schedule, some guest may not know when the meetings are held; the speakers may miss the topic, and attendants will not be prepared to ask and answer questions. In a professional organization, meetings are scheduled in advance to inform the members attending the meeting about their timings and agendas are set so that everyone can come prepared to discuss the topic resourcefully. 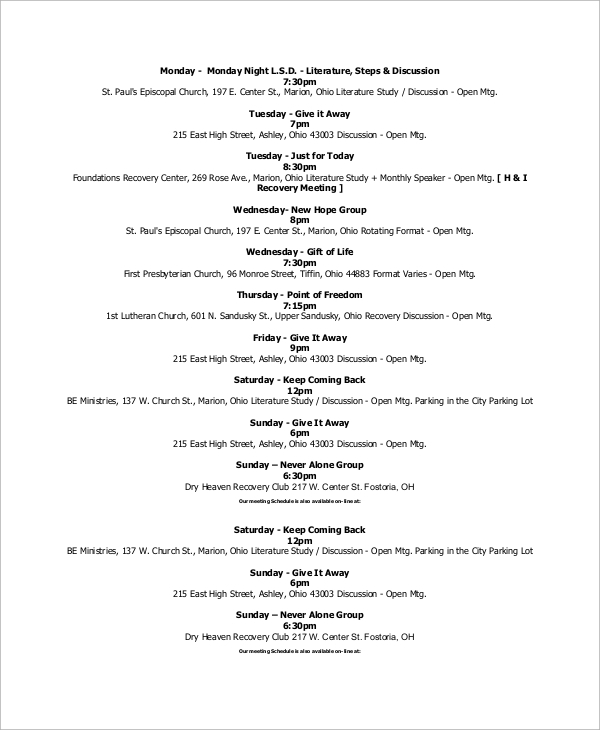 You can also see the Sample Project Schedules. 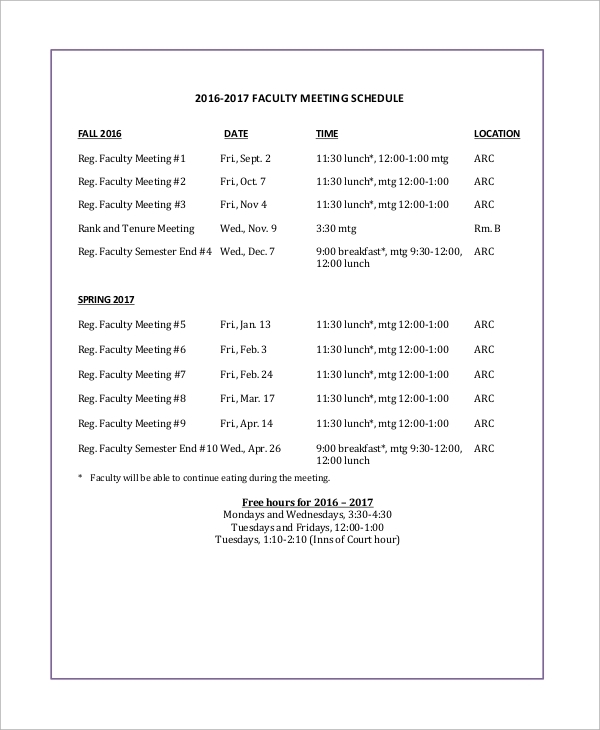 This is a perfect template for faculty meeting schedule. It is clean and has provisions to write the period, date, duration and location of the meetings. 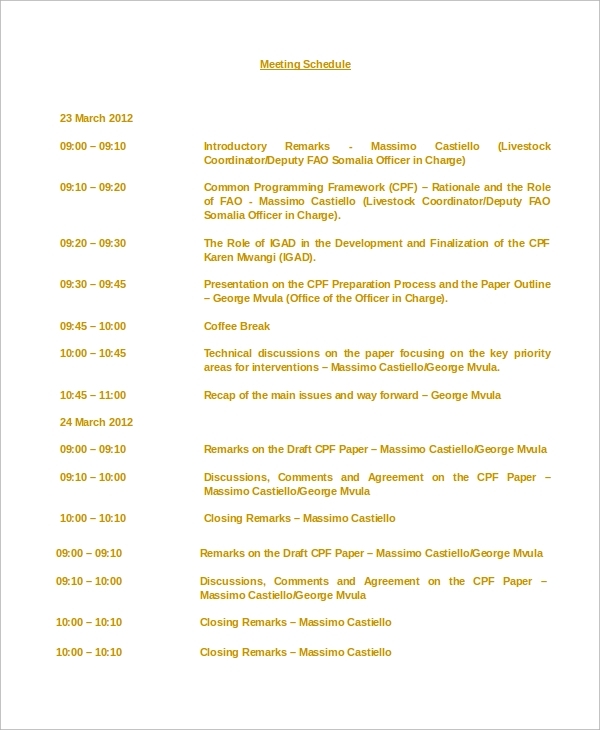 It also has sample meeting agenda form to set the agendas beforehand with discussions and achieve in due time. 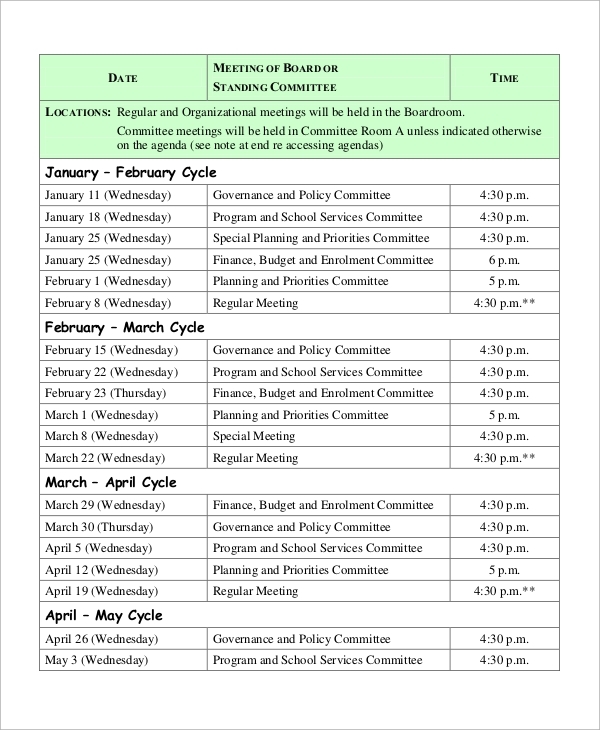 This is a sample program meeting schedule whereby the timings and dates are specified followed by the minutes and programs that will be conducted in those time periods. It is important for organizing any program which can be cultural, corporate or a general meeting and the attendants and the guests must know which program is going to be held at what day and time. 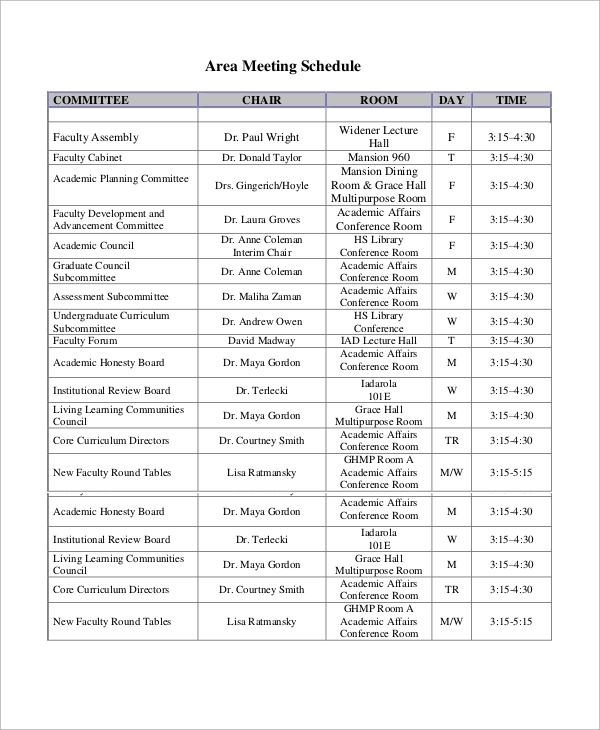 The targeted audiences for the meeting schedule templates are those responsible persons who set the agendas for a meeting, those who set the schedule for the meetings to be held beforehand and those who write the Meeting Minutes. They are also applicable to interview schedule for new recruitments and hence, hiring managers and their assistant need such templates. As a matter of fact, every assistant of higher officials needs them to brief the speakers to prepare their speech and be ready for the meeting with agendas to discuss. The above-listed meeting schedule templates cater to a wide range of scheduling requirements. They can be used as maintenance schedule template, Interview Schedule Samples for recruitment, general meeting minutes and agenda setting templates and much more. They are necessary for holding any important meeting in any workplace so that the speakers and the attendants know what to expect.